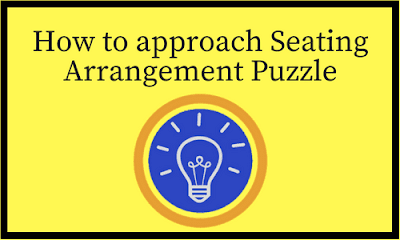 In all recent examinations, seating arrangement puzzles find an important place as there are more than two puzzles in every question set we come across, among which one is definitely a seating arrangement puzzle combined with blood relation puzzle. A logical analysis with speed gaining techniques will help us to score in this important area. Many of us have a habit during exams- To skip the question if it is lengthy. The length of the passage has nothing to do with the level of complexity. Continuous practice of seating arrangement questions would reveal that many of the sentences given are very easy and are provided to increase the time taken to solve the puzzle. For e.g wife of A is described as mother of A's son. It is very important to pictorially represent the given puzzle so that we easily understand and proceed to solve it. If the people are sitting in two straight lines facing each other, follow the ladder method i.e draw a horizontal ladder, so that we don't get confused on who is opposite to who. If there are even number of people in a circle, follow the plus-cross method. i.e Draw a plus and a cross together to represent the circular table. If there is an odd number of people, there will be no issue about sitting to the opposite. So draw them around a circle. Narendra and his family live in a house. There are nine members in his family. They are Narendra, Aditya, Meira, Sonia, Rahul, Mukerjee, Ramnath, Arvind and Sushma. The relationship of the family members with Narendra is described as Father, Mother, Brother, Sister, Wife, Daughter, Son and Brother in law but not in the same order. All the family members sit in a circular shape in their hall not necessarily in the same order. Some members face the centre while some face out. Ramnath has a sister.The mother of Narendra's son is Emily and sits second to the left of the married son of Narendra's father. Arvind is brother of Narendra's daughter. Narendra's brother is seated on the immediate right of the brother of Narendra's sister and the two face the same direction. Narendra faces out and Mukerjee is a male member. In two generations, the members of the same generation are sitting immediate next to each other and face the same direction. Narendra's father sits third to the right of Narendra's daughter. Either Arvind or Ramnath sits third to the left of Meira's mother, but both Arvind and Ramnath face the same direction. Aditya is female member and belong to the same generation of Narendra. Rahul sits on the immediate left of the grand-daughter of Narendra's father. Narendra's father does not sit immediate next to his children. Rahul is facing the centre and is second to the right of Narendra. Aditya sits second to the left of Mukerjee. Rahul is not the father of Ramnath. No three members seated together can face the same direction. 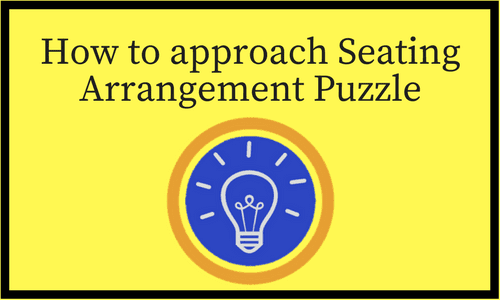 This is a seating arrangement puzzle combined with a blood relation puzzle. Hence, we need to solve the blood relation puzzle, after which we start to solve the arrangement. The relationship of Sushma and Rahul are not directly mentioned in the passage, which we guess with the gender of the names. Now, let us start to fill the people in their respective places. Start with the direct clues and group the direct clues. Ramnath and Narendra face out. Ramnath is on the immediate right of Narendra. Sonia is second to the left of Narendra. Rahul faces centre and is second to the right of Narendra. Rahul is on the immediate left of Meira. Hence, we get the definite positions of Ramnath, Narendra, Sonia, Rahul and Meira. It is given that " In two generations, the members of the same generation are sitting immediate next to each other and face the same direction." Rahul and Ramnath are of same generation. But they face opposite directions. So the generation of Mukerjee-Sushma and of Arvind-Meira should sit near each other and face the same direction. So, Arvind sits next to Meira and faces out. Mukerjee sits third to the right of Meira. And then Sushma sits next to Mukerjee. Aditya sits second to the left of Mukerjee. So Mukerjee should face the centre, so does Sushma. It is also given that, No three members seated together can face the same direction". As Mukerjee and Sushma face in, Sonia should face out. Ramnath and Narendra face out, So Aditya faces the centre. After we arrive at this final stage of representation, it takes only a few seconds to answer the questions asked on this puzzle.